A Sample box of SIGA products for those interested in getting a feel for the exceptional performance and adhesive strength of SIGA tapes and membranes. Perfect for first time customers who want to see the products! For shoppers who are new to SIGA tapes and membranes, this sample box is now available! SIGA’s acrylic adhesive is truly exceptional. Not only is it incredibly sticky, but it will maintain that quality indefinitely, without drying out breaking down. This offer gives those new to SIGA a chance to experience SIGA’s exceptional durability, performance, and adhesive strength firsthand. We believe this product is the best, and we want you to see why! A sample of Wigluv tape, a sample of Fentrim tape, as well as a sample of Rissan. 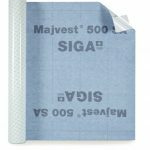 It contains a sample of Majvest, SIGA’s extremely durable performance housewrap. 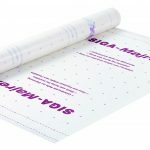 It also contains a sample of SIGA’s interior vapor membrane, Majrex, which has directional permeability, making it the best interior vapor membrane. The box includes information on all enclosed products, as well as other promotional materials.